When 10 year-old Lizzie and her 7 year-old brother Peter are put on a train to be evacuated to Yorkshire at the beginning of World War II, neither are very happy about leaving the mum and Nana behind in Hull. Both would rather risk the German's bombs than leave home. In York, the children are chosen by Madge and Fred and then are placed in the home of Madge's very depressed sister Elsie, who has lost both her husband and her young baby Alice within a year of each other. Young Elijah, part of a clan of Travelers, also called Gypsies, has a secret known only to the very mean-spirited Bill. The Travelers are not very welcomes wherever they go, and the Yorkshire moors are no different. As they prepare to leave and go the the big fair, Elijah's mother asks him to take baby Rose with him when he goes to check their snares to see if they caught anything. But half way there, Elijah is confronted by Bill, who demands he leave Rose in order to go catch rabbits with him, or he will tell Elijah's secret. Out walking, Lizzie and Peter hear Rose crying and not seeing anyone around, take the baby home with them. Elsie, seeing the baby, believes that it is her Alice returned and immediately comes out of her depression and transforms into a relatively pleasant person. But word is out that the Travelers are looking for a lost baby. Elijah's mother, beside herself with worry and grief, wanders around looking for her when she comes upon Elsie pushing a baby carriage. Elijah immediately realizes that Lissie knows something about the missing Rose, but can he get a gorgio or one of the settled or non-traveling people to help him get the baby back to her rightful mother, given how much the local people dislike the Gypsies? First of all, this is not really a book about WWII. The war is the way Lizzie and Peter end up in a place where she is faced with a mortal dilemma among strangers whose behavior is questionable. Lizzie has a much clearer, more defined sense of right and wrong than the adults around her, who have let prejudice blur the lines between the two. Had she been in a place where she knew with the people around her, it most likely would have been a very different story because of their possible influence over her, but distance and unfamiliarity put her on neutral, more objective footing as far as the locals and the Gypsies are concerned and make this a workable story. 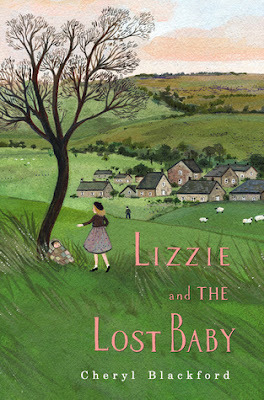 Lizzie and the Lost Baby is a quiet story, without a lot of action, but it certainly asks questions about how people act in stressful times. The dislike and mistrust the locals and Travelers have for each other is an interesting issue given the war that is being fought at the time. Prejudice is evident on both sides, and you have to wonder it could ever be resolved, though the novel does end on a hopeful note regarding that. This story reminded me of so many of the girls' novels I read that were written in the early 1940s in England, and in which the tension between locals and Gypsies were part of the main story. Interestingly enough, the Gypsies (they were never called Travelers) were depicted in a much more sympathetic light than the locals, just as they are here. Life and learn: because the name Travelers is used in Lizzie and the Lost Baby, I thought that perhaps they are English or Irish, although the use of the words like gorgio and kushti (meaning good, fine) would indicate that they were Romani. Turns out that the names Gypsy, Traveller and Romani are interchangeable. All in all, Lizzie and the Lost Baby is a interesting novel for readers who like historical fiction, but don't expect a real home front story. I just sent link and about this book to niece. Thanks for sharing. Sounds great for her. I hadn't heard of this one. Good to know what it is about and that it isn't a real home front story. Thanks for sharing!